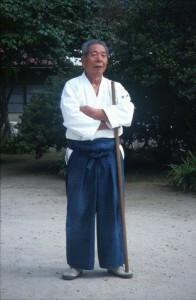 Saito Sensei made his first trip abroad in 1974 to teach seminars in California. His lucid teaching methods made him very popular among Aikido practitioners the world over. He travelled extensively throughout the world teaching from 1974 until 2000. In particular, there are large groups of Saito Sensei’s students in the U.S.A, Sweden, Denmark, Italy, Germany, Australia and Great Britain. Saito Sensei continued the tradition of apprenticeship that he himself had experienced by running the “uchi-deshi” or live-in student system in the Iwama Dojo. 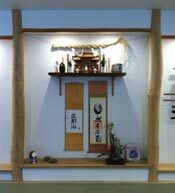 In this way, people were able to live and breathe Aikido in the same dojo that the founder of the art had built and trained in. This gave students from all over the world not only an exceptional opportunity to train the techniques of Aikido in the actual dojo of the founder, but also to get a taste of the culture to which these techniques and adherent principles belong. With Japanese and foreign Aikido practitioners training, working and living together, this was truly a wonderful example of sharing the rich cultural heritage of Budo, in its traditional form, with the people of the world.